Often times, much like jewelry passed down from generation to generation, people inherit coin collections from relatives who were very much involved in in the coin collecting hobby, and then pass them on to their surviving family members. 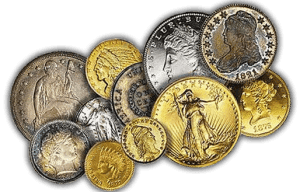 Whether you inherited a coin collection in this manner, or whether you actually accumulated a collection of coins on your own, if you have reached the point now where you’re willing to sell all those coins and have them converted into usable cash, we are the coin buyer in Mesa, Arizona that you should be dealing with. Lots of other coin buyers such as eBay, will impose a 10% surcharge or more in fees to liquidate your coin collection, but that’s not how we operate at our coin buyer store. What do you Offer for My Coins as a Coin Buyer? We buy coins with the intention of providing maximum payouts to our customers, to encourage future business with us and to instill a sense of loyalty with our store and our company. That’s why we try to give the maximum payouts available anywhere in the area, and in fact we don’t think you’ll find a better deal for your coin collection in this part of the state of Arizona, including all the communities around Chandler, Apache Junction, Scottsdale, Tempe, and even Phoenix. What if I Want to Keep my Collection? If your coin collection has some kind of sentimental value to you, or if you are really into the coin collecting hobby yourself, and don’t want to permanently relinquish ownership of your collection, we will give you the option of simply pawning your coins and receiving the same high payout. In this kind of arrangement, we assume temporary ownership of the collection, and you get the cash you need right away. Then over a three-month period, you would make monthly payments on the loan’s interest and principle, steadily lowering your loan balance, and at the end of the three months, if you’ve kept up on all payments, your loan will be entirely paid off, and you will resume full ownership of all coins that were pawned. Are There Specific Coins You’re Looking For? If you have any question at all about whether or not your coins are valuable, or whether we will accept them, please call us and discuss the coins you have to offer. Our expert coin buyer will be glad to apprise you of the actual value of your coins, and then when you visit us in person, we can make a more accurate assessment of the value, based on the condition of the coins, and the content of precious metal. We are the fairest and biggest coin buyer in the Mesa, Arizona region, and we will guarantee you the best prices for your valuable coins.